Cream tarts are all the rage right now. 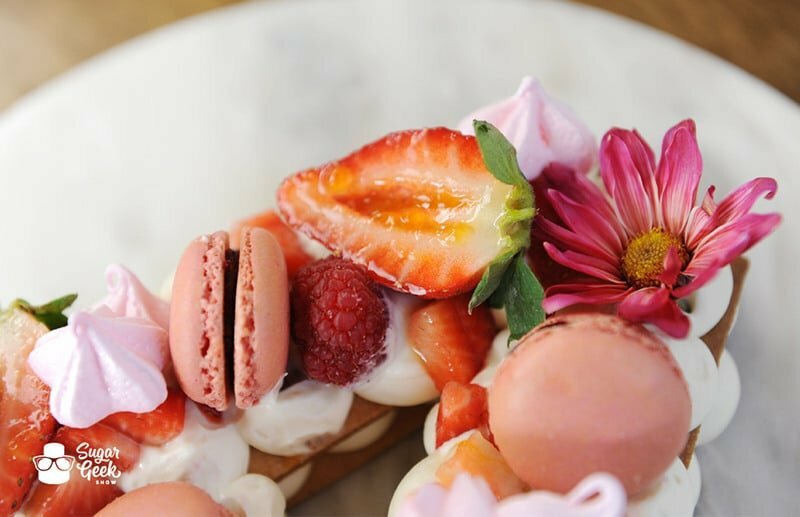 This trendy dessert goes by many names but whatever you might call it, it’s definitely beautiful! 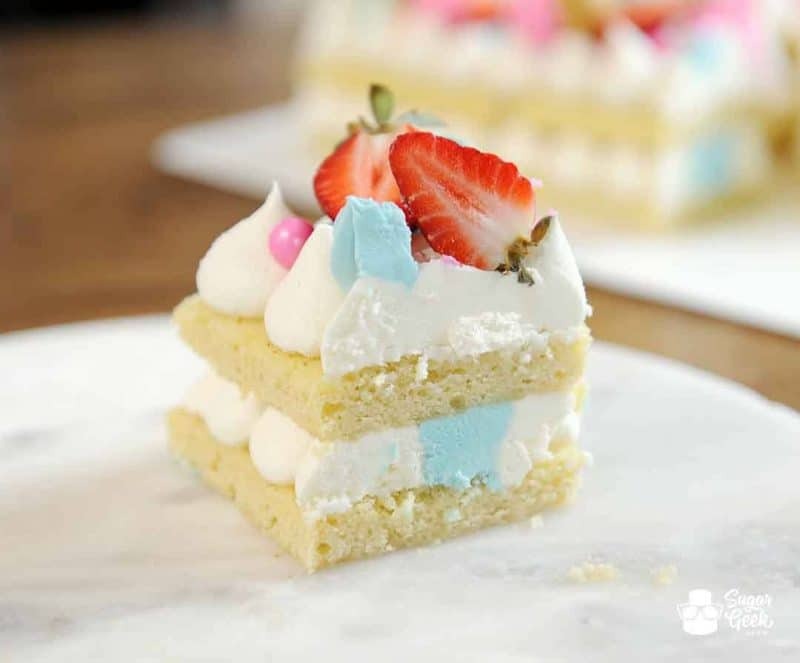 These fresh and fruity desserts have taken the internet by storm! How do you make them? What is the crust made of? What is the filling? Well the good news is, after much research and taste-testing, I have de-coded the cream tart and I’m going to show you how to make one of your own! The cream tart has been around for ages and called many things depending on the baker. It was made popular by an instagrammer by the name of @adikosh123 from Israel. Her cream tarts are so beautiful looking, you may just be tempted to lick your screen. What is a cream tart dough made of? The tarts are typically made from a almond pate sable dough (the cookie or biscuit) which is basically shortcrust or tart dough. This crust is super tender, crunchy and just melts in your mouth. It is not hard to bite or cut. The key is to remember to roll it thin. We made these a lot in pastry school so I was super excited because this dough is fool-proof to make! There is also a version without almond flour called pate sucre if almonds aren’t your thing or you have an allergy. What kind of filling goes in a cream tart? Cream tart filling is traditionally made from pastry cream with freshly whipped cream added into it for a light, fluffy and not-to-sweet flavor combo. Sometimes called chantilly cream or diplomat cream depending on the part of the world you’re in. However, pastry cream can be tricky for beginners to master so I gave myself a little work-around. I whipped up a batch of vanilla pudding and used that as my base instead of pastry cream. Then I whipped up my cream and added in my cooled gelatin (cooled being an important word here) to stabilize the whipped cream and then folded it into the pudding. BOOM. We have ourselves some delicious, stable filling for our cream tart. So how do you make a cream tart? Top with fruit, berries and flowers and enjoy! How long can a cream tart sit out? So because the cream tart has perishable fillings like cream and fresh fruit, you may not be able to legally make and sell these desserts. Most cottage laws do you not allow you to sell perishable creams and fillings. If you’re a licensed bakery you should be fine but check with your local health department to make sure. If you CAN make the cream tart then it’s good to go for 48 hours without getting soggy. Anything longer than that and the fruit is going to start getting mushy and the whipped cream will start to weep. This is one of those desserts that you want to make and then serve up pretty quickly. What can you put on a cream tart? One of the BEST things about making these cream tarts is that you can change them up and make them different so easily. 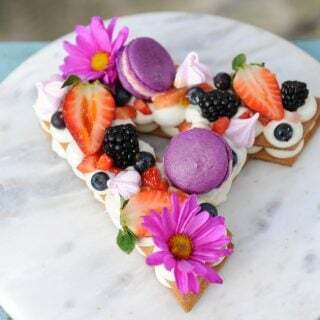 I chose to make my cream tart in the shape of a heart for valentines day but you can make any shape! Alphabet letters, numbers, shapes! 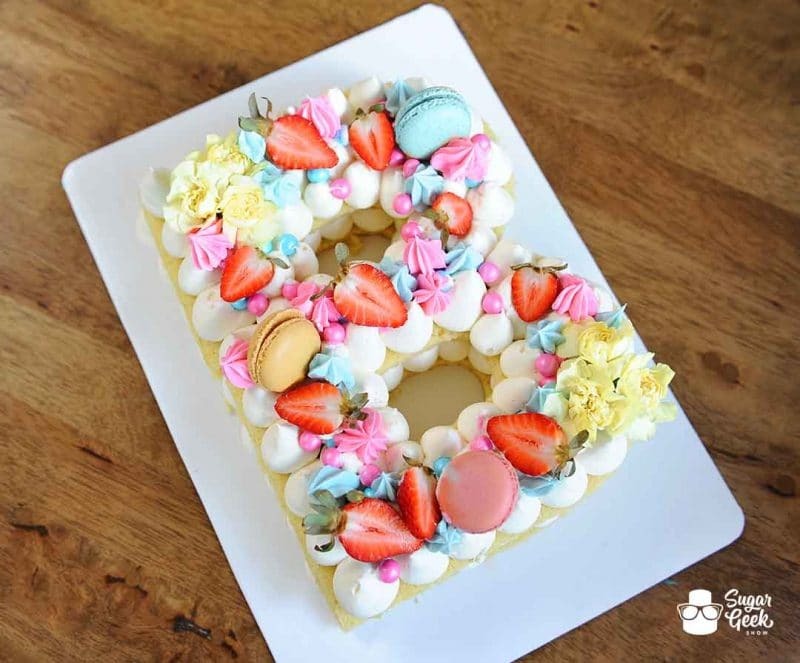 You can easily switch out the fruits or the macarons for cookies and candy. 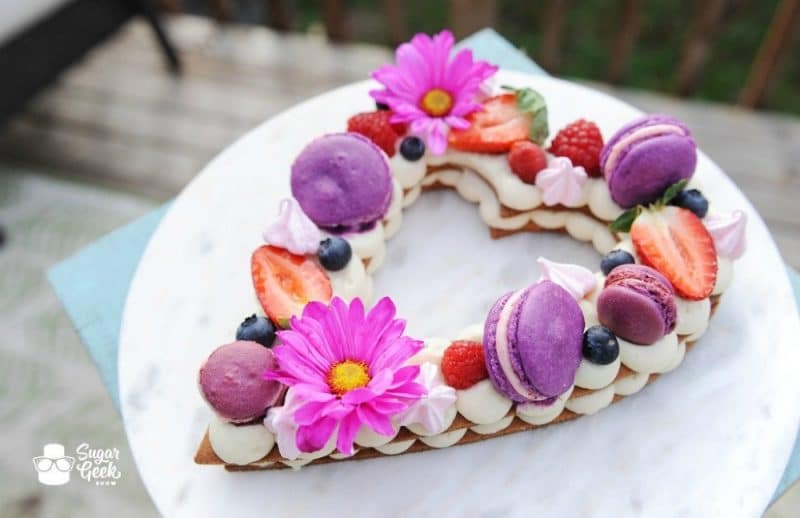 Topping with fresh flowers is super simple too but just make sure you seal the ends of the stems with melted chocolate so that the water from the flower does not seep into the tart filling. I really liked making a strawberry lemonade version of the cream tart! I’m partial to lemon anything and wow the reds and yellows look so juicy and fresh on the cream! You can flavor the cream and make it chocolate instead of vanilla. I thought his would be a fantastic idea for valentines day. I got one of those cheap valentines day candy hearts and took the chocolate truffles to put on top of the cream tart instead of using french macarons. It was super fast! My friend Shani also came out with a full recipe on the chocolate version of the almond sable dough recipe and chocolate diplomat cream. These tarts are so easy to make, my daughter avalon could even pipe the cream! We did a little facebook live where avalon literally does a better job than I do piping the diplomat cream filling. How much should you charge for a cream tart? This is a question I get a lot and there isn’t a GOOD answer but what I can advise is that you run a special and make a bunch at once. If you make up a batch of french macarons, you can freeze the leftovers and take them out as you need them. 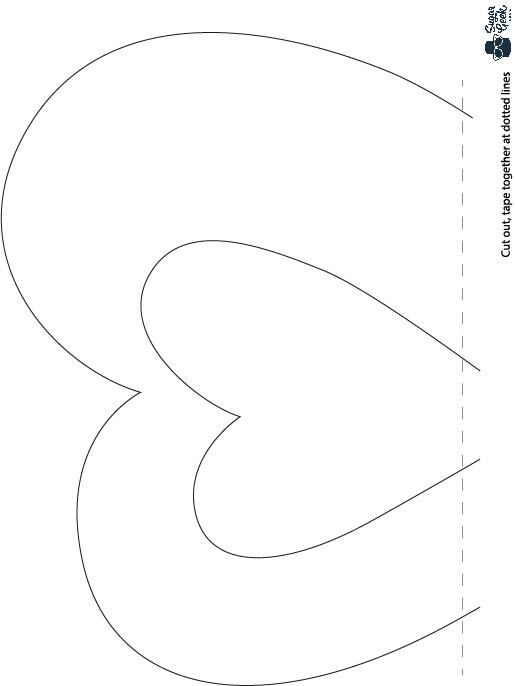 We’re running a valentines day special here at the shop for two days only and set the price at $35 for a 10″ tart. Thats a little more than the most expensive, non-shaped tart you can buy here at a high-end bakery so I felt that was pretty spot on. Obviously prices vary depending on your area. 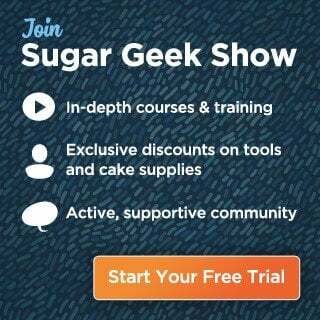 Can you make a cream tart out of cake? Yes! 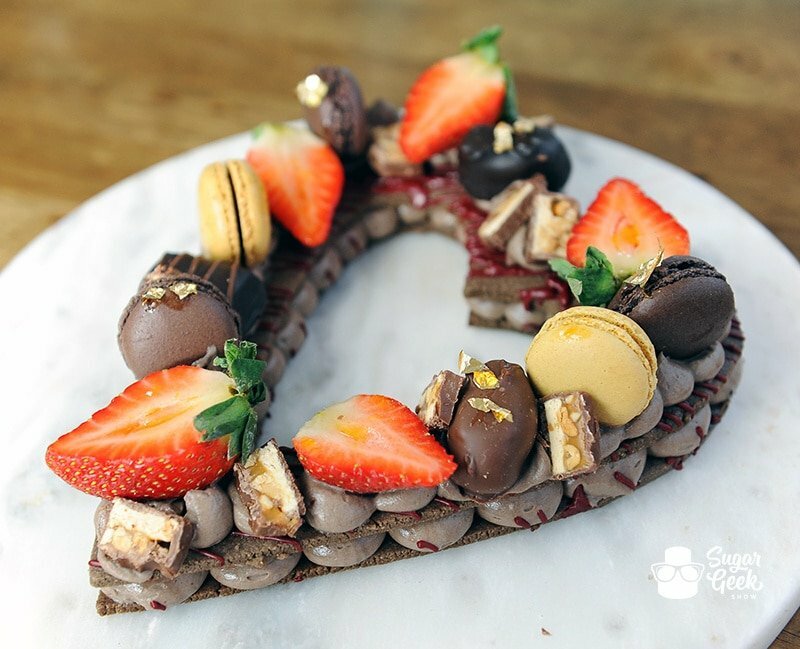 You can totally make this out of cake! But you don’t want to just use any old cake recipe, you want to go with something that can stand up to being exposed to air and still stay moist. I prefer my jaconde cake for the cake portion. 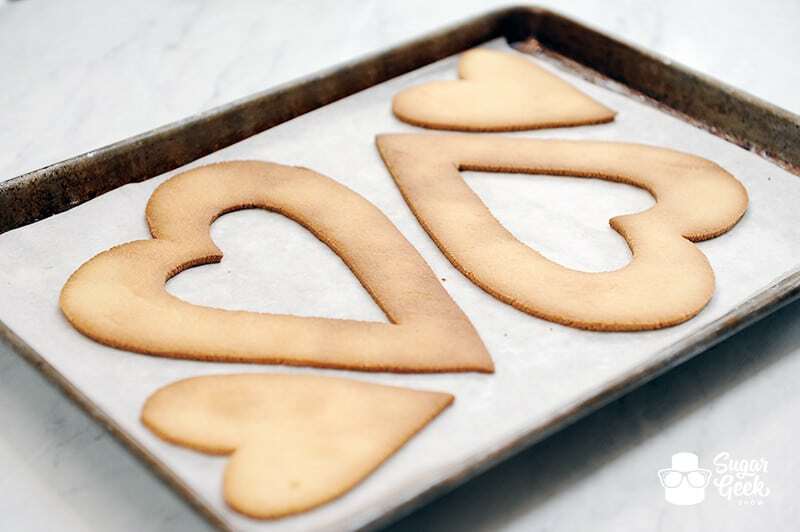 Just bake and cut your shape like you would with the almond sable dough. I keep mine moist by sprinkling confectioners sugar over the surface then placing it in the fridge overnight to dissolve into the cake. 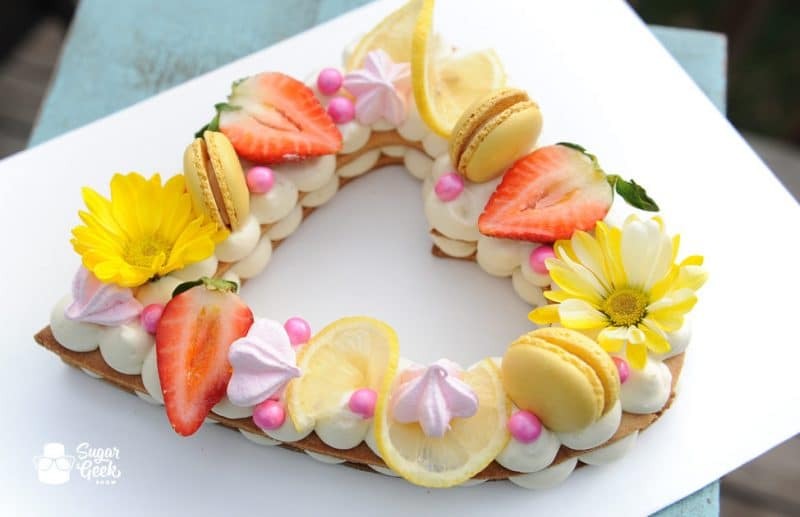 Fill your jaconde cake with some big dollops of easy buttercream and top with fresh fruits, berries, french macrons and flowers like you did with the cream tart. For an added fun bonus, I actually made my alphabet cake into a gender reveal! Wouldn’t this be so cute to have at a baby shower and then cut into it and reveal the big news! The way I put the colored buttercream in the middle was pretty easy. I just did my dollops of buttercream around the outside edges and piped one stripe of blue buttercream down the middle. That way you can’t see the color from the inside or the outside edge but you can when you cut into it! The last tip I have for you is to make sure you glaze any cut berries with some watered down apricot jam. This was a little tip I learned in pastry school. It helps keep the moisture in the fruit and also makes them look really juicy and yummy! You don’t have to worry about glazing the berries like blueberries or blackberries, only the ones that are cut. This can be made many ways but this recipe uses traditional fillings that can be found in fruit tarts which is what this recipe is based on. Feel free to switch out flavors depending on your theme. Roll out dough to 1/8" thick on parchment paper. 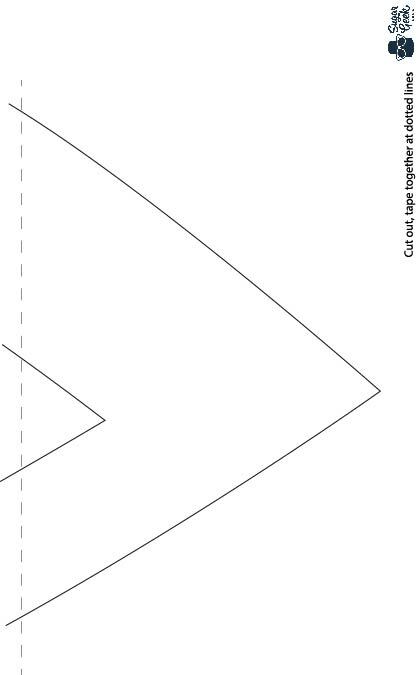 Use a template to cut two shapes. Chill in the freezer 5 minutes. Whip 1 cup heavy whipping cream in a mixer with sugar and a whisk until thickened. Add in your vanilla and drizzle in your cooled gelatin. Whisk until thick and fluffy. Fold together the pudding and the whipped cream until smooth. Put mixture in a piping bag with a medium round tip. Pipe even dollops around the inside and outside edges of the cookie. Lay the next cookie on top and repeat the process. Add on your favorite toppings and enjoy! *note: to keep fruit fresh and shiny, brush lightly with thinned down apricot preserves. This tart is not shelf stable and should be refrigerated. It can be kept for up to 24 hours in the fridge before serving. Dough is very light and crunchy! 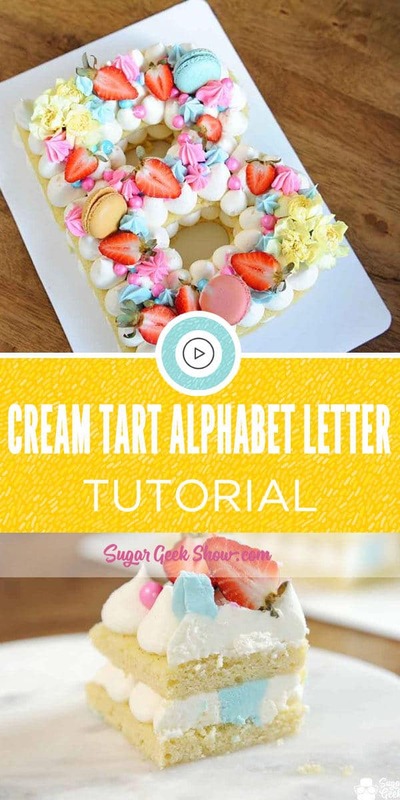 Learn how to make a trendy cream tart!